The overarching themes behind this play are social media growth, personalisation and global digital expansion via greater inter-connectivity amongst users. Viacom (NASDAQ: VIAB) is a US$14BN ($AU18.3BN) showbiz jungle-king with global commercial connections split across all forms of media and technology, and generates around US$10BN in annual sales revenue. ....because let’s face it, every company, promotion or even just one-off events — now come packed with an ‘app for that’ as standard. Before we go too far, we should point out that this deal is at its very early stages and as with all speculative tech stocks anything can happen. If considering CM8 for your portfolio seek professional financial advice. Beyond simple apps, users want customised features and quirky innovations also as standard. One new digital market niche that has developed is ‘Emojicons’ – or emotion icons that provide users with a greater ability to convey real-time emotions to each other. Viacom has dozens of different brands and franchises which it monetises through direct subscribers and advertising. However, the next phase of its global media empire expansion is to digitise its entire set of operations and provide mobile-functionality on every step, catering for users’ every whim and desire. CM8 has been recruited by Viacom, from a host of other plucky small-cap digital start-ups, because of its ability to deliver the precise solution this juggernaut needs. In return, CM8 will be plugged directly into the mainframe of Viacom’s digital expansion, and work on developing innovative functionality for some of Viacom’s more popular shows, including a series of Q&A apps. For those who don’t know, Viacom owns film production and distribution companies such as MTV Films and Nickelodeon Movies, plus TV networks such as MTV and Nickelodeon. For a full list of Viacom’s media assets, check this out . CM8’s Q&A division has already been successful with other projects, achieving record growth in the 2016 financial year [FY16 revenue up 61% to $20.7M] and the Viacom deal could further advance its bottom line. The deal CM8 struck with Viacom could be a strong validation of its core strengths and ability to grow into a large digital-media and development company over the long-term. In the short-term, CM8 already has some alluring features that may appeal to the small-cap investor: growing revenues, already profitable, institutionally backed and imminently expanding into China. The cherry on top is that large powerhouse companies are looking to play catch-up in the digital arms race, and signing deals with CM8 is one way to help their advance. There is an inkling that this digital minnow will successfully grow and develop into a digital cash cow, now guided and supported by a king of the digital hill. 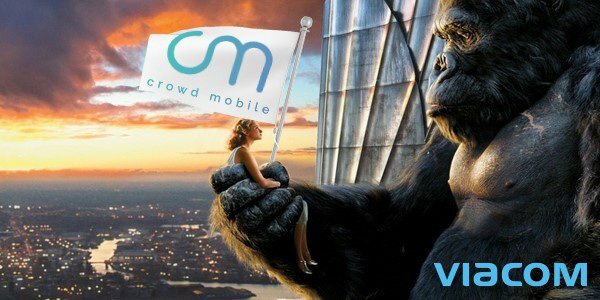 Crowd Mobile (ASX:CM8; FWB-XETRA: CM3) is a digital babe in the woods. The company remains a young up-and-coming start-up, but this may not be the case for too much longer. We first brought you CM8 way back in February of 2015 in our article, “ New ASX Tech Company has the Answer? ”, where we introduced the business case behind this opportunistically-minded mobile-focused developer. CM8 is currently undergoing a Rights Issue to raise circa $1.5 million , at an issue price of $0.16 per share, plus 1 free attaching option for every 2 new shares. This rights issue will further bolster the company’s balance sheet, and will allow the company to really take advantage of the opportunity that is being presented to them with Viacom. Pleasingly for investors, CM8 Directors Dom Carosa and Theo Hnarakis are sub underwriting significant commitments to this rights issue – indicating they are bullish on the company’s forward looking prospects. The Rights Issue was recently extended and will now close on Monday October 17 th – plenty of time for the market to fully digest the enormity of the deal struck with Viacom. In essence, CM8 has two distinct business streams that are generating revenues, and the recent deal with Viacom further adds commercial potential because CM8 has now set about delivering five new apps to Viacom over the coming weeks. The deal includes a revenue-sharing agreement which means that once the apps generate sufficient popularity, CM8 will be odds-on to generate perpetual income from user transactions being done. Any revenue generation from this deal is speculative at this stage and no guarantee to occur. Investors should take a cautious approach to their investment decision and do their own research before making a decision. CM8 is all about conducting micro-transactions of $1 or even less — but many times over. All its previous applications, and future apps built for Viacom, are designed to attract users to make small transactions in exchange for personalising something on their phone or to ask a question from a professional, as just two examples. The deal with Viacom will see CM8 developing digital ‘emojis’ and Q&A apps to complement and monetise Viacom’s star-studded list of celebrities on its books. This was the headline in a national newspaper in the UK back in July this year. 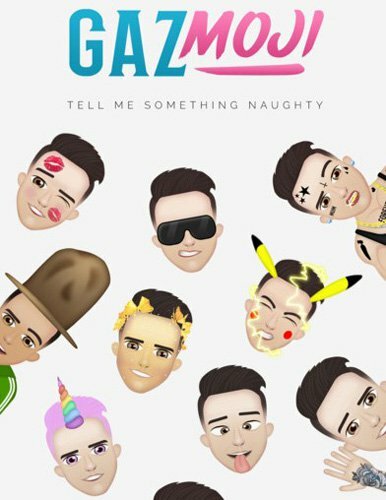 All the kerfuffle was because one of Geordie Shore’s primetime characters, Gaz Beadle, had launched his very own range of ‘emojicons’ – courtesy of CM8. The news lapped onto the shores of millions of teenage girls’ (and boys’) mobile phones courtesy of viral advertising, and in the end led to millions of downloads by fans. The Gazmoji app was ranked the #1 paid entertainment app in nine countries and was in the top five paid apps in 18 countries. As you can see, in the modern world of everything coming customisable and interactive as standard — CM8 and Viacom are definitely barking up the right tree. Increasingly more celebrities are desperate to reach out to engage their fans — CM8’s digital emoticons are a very quirky and scalable way of tapping millions of celebrity-obsessed fans for a few dollars at a time. CM8 and Viacom’s Emojis will capitalise on the global trend of personalisation and the addressable market is potentially huge. Pretty much anyone with a smartphone and a reasonable propensity to listen to role models fits into the emojicon target market. Companies such as Starbucks, Dunkin’ Donuts, Burger King have all launched catchy digital ‘stickers’ for customers to collect and further stimulate future sales revenue. This ties into the Emojicon theme because snazzy online promos and snazzy personalised digital icons play into the same theme: the overlap between engaging customers and cross-selling other products is becoming blurrier with each new iteration of smartphone or messaging platform. ...but over the next few years, this space will grow to include other parts of society that aren’t as quick to refresh their lorry-load of apps. Or are keen to discuss something other than what a celebrity had for breakfast. Emojicons are a simple and effective way to do what humans love doing most: communicating. By having a scalable way to facilitate such communication, CM8 is delivering exactly what smartphone users are screaming out for: more options, and more choice in how they communicate. Any time a high potential innovative tech stock with big and bright ideas rears up, many investors always reach for the salt. It’s not because they are inherently cynical, it’s just that there are so many ideas out there — picking the profitable ones is like sorting the wheat from the chaff. Investors like to make investment decisions with the mantra that early revenues and cash-flow positive status are excellent milestones by which to mark their steeds — especially when considering backing them at an out-of-the-gate early stage. ...and more importantly, a possible leading indicator of what’s ahead. Investors would be chuffed to see triple-digit gains in revenue, EBITDA, cash flow and NPAT. That’s what an optimistic small-cap investor could confidently term as performing with ‘flying colours’ — even though CM8 is still at an early-stage of growth. But what do the analysts think? 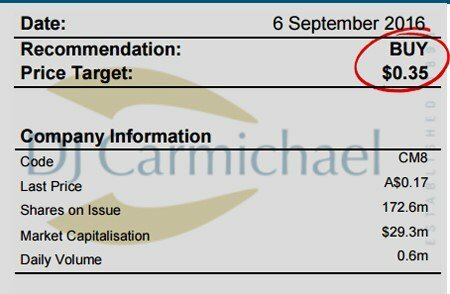 “We value CM8 at $0.70 share with a price target of $0.35 and maintain a Buy Recommendation”, citing CM8’s “Q/A business growing organically beyond our expectations”. The detailed report slaps a $0.35 near-term share price target (141% premium to current price of $0.145), and a longer-term valuation of $0.70 per share which equates to a 382% premium compared to today. Now, we must remind readers here that analyst price targets don’t always eventuate – so apply caution when investing and don’t just go on an analyst price target alone. One of CM8’s flagship products in terms of having unique appeal and strong longevity value is its Q&A platform that can be plugged into any other apps it develops for itself or third parties. What if you could have a financial advisor, lawyer, tax practitioner, vet or doctor in your pocket at your beck and call? CM8 has made this a reality, and once again it’s made possible by smartphones and micro-transactions. CM8’s core offering avoids the run-around by allowing you to search for the expert advice you need. Everything from financial advice to fashion is covered in its products – where a person pays a small amount to connect to an actual expert who is then paid for their time. This type of peer-to-peer customer support is a masterstroke idea because of the fact that accurate information is becoming increasingly more difficult to find. As gigabytes of new content are uploaded to the internet each day, a lot of it isn’t very useful or valuable – which helps to thrust CM8’s boutique haute couture question and answer service into the commercial spotlight. One very intriguing line of progress we are keenly anticipating is CM8’s move into China. We all know and understand that Asia is currently expanding its digital footprint at an unprecedented pace. Countries like China, South Korea and Japan are seeing incredible leaps in smartphone sales, digital app downloads and micro transactions across all age groups with millennials understandably leading the commercial charge. With CM8 now able to leverage off SmartTrans payments platform, it can now move quickly to re-purpose, re-badge, and monetise its already successful Apps in the largest e-commerce market in the world. As CM8 has just entered this market it is difficult to say what their impact will be; how much revenue can be generated or what type of market share they can attract. As such this should be considered as just one factor in the overall investment decision. If considering this stock for your portfolio, seek professional financial advice. Asian consumers are famous for being glued to their phones just as much, or even more so, than their Western counterparts so CM8 will hopefully have a torrent of customers from Asia once it makes it formal launch there early in 2017. The world is running off into the digital sunset as both software and hardware innovations continue to add more features, interactivity and choice for all smartphone-wielding consumers. CM8 has already taken a small foothold in the apps space with its innovative Q&A software that bridges the knowledge gap and helps to foster interactivity amongst users. The next stage is to ‘bolt-on’ this functionality into all its other development, now significantly bolstered by the introduction of Viacom — a true market giant that has a twinkle in its eye for very small yet ingenious solutions to add to its jungle lair. Traditional messaging and communication are gradually leaving smartphone users underwhelmed when you consider the staggering pace of online functionality – which is possibly why emojicons have made such a sharp market entry. Emojicons may seem very childish at first, but if you delve deeper, they are an ingenious way to engage billions of consumers without any language or regulatory barriers in sight. The bottom line is that regardless of age, everyone wants to connect and communicate with other people in interactive and engaging ways. CM8 has already proven its mettle with its Q&A product, already generating in excess of $20M revenue per year. Emojicons do to online messaging services, what comic books did to reading — not replace, but enrich — to the point of welcoming new users and improving the experience of existing users. The growth of this customised, emotion-fuelled extravaganza for all age-groups has even been allocated its very own verb much like ‘googling’ or ‘twerking’. When it comes to sharing emotions in a vivid way, it has been termed ‘Bitmojing’, and CM8 is ‘mojing’ for a bit of a commercial song with this latest expansion of its digital repertoire. Get set for a big rumble in an even bigger jungle once CM8 and Viacom have taken care of compatibility and aesthetic details over the coming months.